Read the book of Greek mythology and unearth the ominous past of Medusa, the serpent queen of the underground. This dark and eerie 5 reel from NetEnt has a maximum payout of 5000 coins if you can match Wilds and Scatter symbols to devour some free spin bonuses and cash rewards. NextGen have been making substantial waves in the online slot industry for nearly 20 years, delivering title after title loaded with rich imagery, quality audio and SFX, and enduring, engaging stories. Nothing makes it to the slots as a NextGen title without it being quality checked for entertainment and playability. Gamers and gaming hosts alike always eagerly await the next NextGen title to hit the slots. NextGen have a nice habit of transporting us to a specific place in time, myth, or both. In Medusa, they give us the rare chance to stare the Gorgon Queen in the eyes, and live to tell the tale (or at least avoid being turned into stone!) and perhaps leave with a toga or two full of treasures! Medusa is the star of her own 5 reel, 25 payline online game – and we regularly hear the sandy rattle of her tail, and languorous wail of her Gorgon sisters in the eerie sound effects. Set beneath dark, misty skies and at the scene of a legendary battle between man (or perhaps Spartan) and beast (although Medusa prefers the prefix: God), there is a tense atmosphere as we spin the Spartan warriors, juicy Grapes, battle-worn Spears, Snakes, Vases, Coins, Temples and Gorgon Shoes. The alluring lady herself is the Wild, and will regularly trigger 3 Free Spins, before turning sticky and expanding to cover one of the 3 central reels. During this bonus, we collect the sword-wielding solider symbols to increase our multiplier - and potential reward - substantially. Pegasus, Medusa’s legendary flying foal, also offers the chance to enter a nice bonus round – find 3 of this winged horse and we get the chance to choose an instant cash prize, or even enter a double-or-nothing accumulative mini-game. With a nice variation between minimum and maximum bets on this online slot, £0.01 and £2.00 respectively giving us the opportunity to play for fun or stony-faced serious action, Medusa offers a nice range in variability, with an impressive range of prizes and bonuses backing this up. What the game might lack in narrative is rendered obsolete by its playability; the regularity of wins and the vibrant mini-animations and accompanying sound effects are pleasing on the eye, ear, and pocket. The variation of the audio, in particular, with different SFX assigned to different types of win, make the variety of output impressive – the whip-crack of lightening makes the heart flutter every time! This online game brings with it everything you’d expect from a classic NextGen title. There is a distinctive atmosphere to the game, making what is a relatively simple online slot a genuinely pleasurable gaming experience. Dream Jackpot rate this as a good, go-to game for anybody who fancies a good combination of entertainment, and involvement, but isn’t in the mood for tactile, complex gameplay. 8/10 for this NextGen classic. 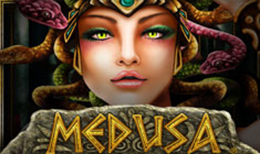 Another game is waiting for you, Try your luck and play Medusa 2.